The disability certification norms have set certain criteria for eligibility for promotion. Those having more than 40% of disability are eligible for quota promotion. It is reported that the disability suffered by the three government doctors eligible for the post of civil surgeons allegedly did not meet the eligibility criteria yet they took advantage on the basis of fake certificates. Dr Singh, Civil Surgeon, Ludhiana, was found 24 per cent disabled which was in contradiction to the certificate of 45 per cent disabled submitted by him. His certificate had mentioned that he was suffering from forward bending of spine and ankle disability. He has now been disqualified from the promotion. The disability of one Dr Gupta, Civil Surgeon Sangrur remains in question and yet undetermined as the case was forwarded to PGI due to unavailability of a neurologist in the area. Sources said that the case pertaining to Dr Gupta was handed over to PGI keeping in mind the authenticity of the probe. The findings of the re-examination report have received confirmation from Satish Chandra, Additional Chief Secretary, Health. The report would now be forwarded to CMO and Commissioner for Disability from where they had got the instructions to probe the matter, who will finally take call in the matter. 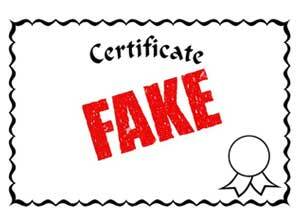 Submitting fake certificates for promotion whether it is for promotion or any other benefit is known to happen in our country.The only difference is that because of internet communication channels, more people are able to know about it now. The issue of submitting fake service certificates and research for promotion in some private medical colleges by the private medical practitioners with PG qualification is also known but the usual result till now is no proper enquiry or punishment to the guilty.